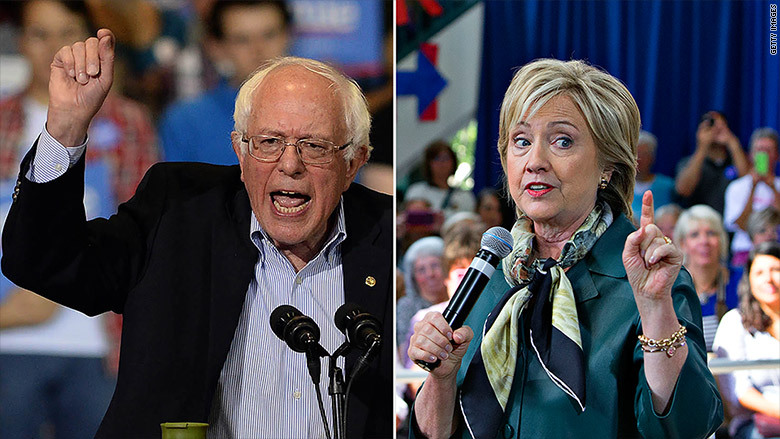 While political pros speculate about how Hillary Clinton and Bernie Sanders will fare in their first debate, television pros are debating how many people will tune in to watch them. By the usual standards of cable news, Tuesday's match-up in Las Vegas will be highly-rated. But this year is unusual thanks to the off-the-charts-ratings for the Republican debates. The Democrats' turn in the spotlight will seem much less popular by comparison. More than 25 million people watched Fox's GOP debate on August 6 and CNN's debate on September 16. (These totals count live broadcasts, streams and repeats.) Donald Trump is pretty unanimously credited with driving record viewership to each channel. For the Trump-less Democratic version, 5 million is more likely. Some prognosticators have higher estimates and some have lower. The last time CNN had a Democratic debate in the month of October — 2003, in Arizona — an average of 1.75 million people tuned in. Forums in 2007 and 2008 with Clinton and Barack Obama drew bigger audiences. An MSNBC debate in October 2007 in Pennsylvania averaged 2.46 million. Generally speaking, the later in the primary election cycle a debate takes place, the higher the ratings are, CNN Washington bureau chief Sam Feist said. CNN's Vegas debate in November 2007 averaged 4.04 million viewers. Until the GOP debates reset the bar this year, the highest-rated debate in cable news history was Clinton and Obama's head-to-head debate in January 2008 when 8.3 million tuned in. A rematch three months later, televised by the ABC broadcast network, averaged 10.7 million viewers. Feist cautioned, "You can't predict the ratings for this Democratic debate based on the recent Republican debates because those are apples and oranges." He noted that, aside from the Trump effect, the Democratic debate will feature fewer candidates than the Republican ones have, which could tamp down audience interest. There are other factors too. There's stiffer competition on television in October, including the MLB playoff games, than there was at the time of the two GOP debates. On the flip side, there may be a "Trump halo effect" from the GOP debates that extends to the Democratic side. Mediaite columnist Joe Concha predicted in a Monday blog post that 10 million people will tune in, citing the public's interest in the election cycle and a "curiosity factor" around Clinton. Additionally, there's definitely anticipation among Sanders supporters for his first time on a presidential debate stage. Anderson Cooper, who is moderating Tuesday's debate, didn't venture a ratings guess during an interview on Sunday's "Reliable Sources," but he called Trump's effect on the GOP debates "extraordinary" and said it's been "good for the process" by spurring interest in the primaries. CNN began promoting Tuesday's event immediately after the Republican debate four weeks ago, and coverage has ramped up in recent days. The network will be live-streaming the debate on its home page for viewers who are away from a TV or don't have cable.